Yes, I love my coffee. I think about it just as my eyes open in the morning and most likely again at night before I go to bed since it is the first thing I do when rising each day. I can remember being a child and watching my grandparents enjoy their coffee and wondering what all the fuss was about. I was little then and now ... simply put, I am a coffee addict. I usually drink my coffee with a splash of cream and on occasion just black. I like strong French roast coffee and I like it hot. When we had a traditional coffee pot I loved ours that ground the beans and then made the coffee. It was amazing and I loved the first pour (I am convinced it tastes different) and my husband gracefully let me have it. Nope, not high maintenance at all, what made you think that? These days this coffee maker greets me every morning with a smile and hot water ready for a perfect cup of coffee. My Keurig plus my favorite coffee in one of my favorite mugs is always a good thing, don't you agree? I got this set of mugs for Christmas and it is currently topping the charts as a favorite. 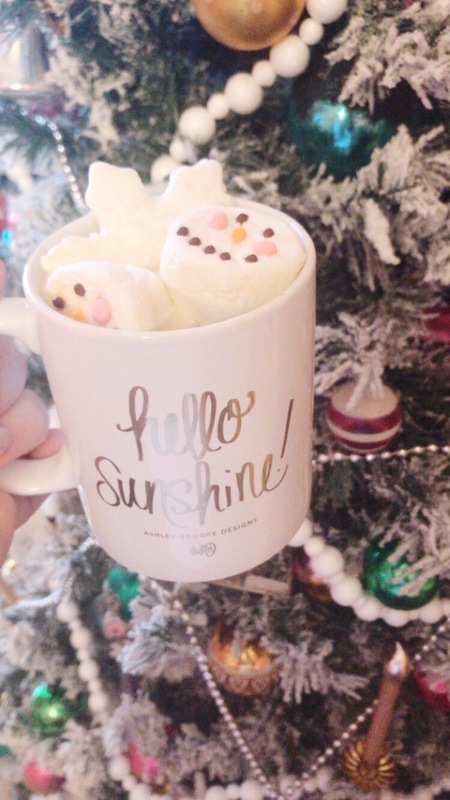 A few weeks ago while making cocoa for the kids I dropped some fun marshmallows into their drinks and then on a whim added two to my hot cup of black coffee. 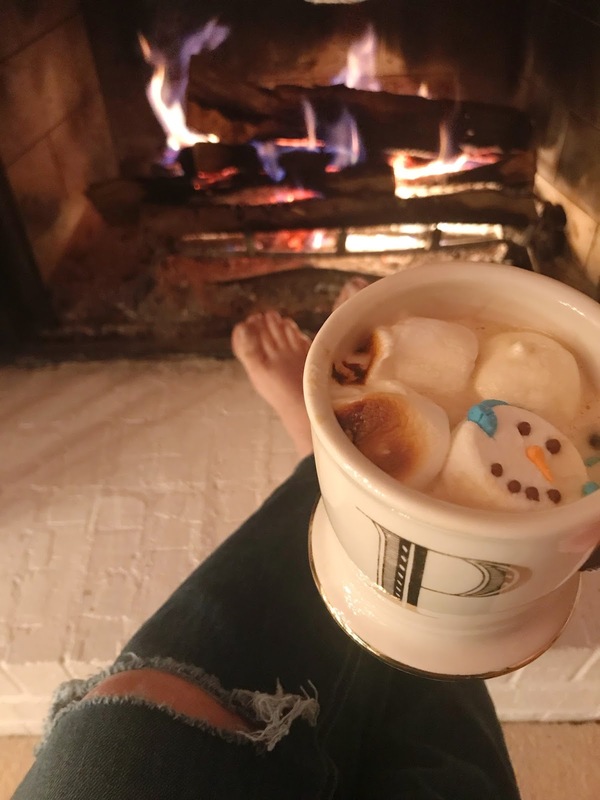 The marshmallows began to melt and seal up the top of the cup and it was magical. A tiny bit sweet and the peppermint marshmallows I used made it the best cup of coffee I could recall. I made it again the next day, and now it's my daily new order. I have one cup upstairs with the Hubs and then when I go down the second cup has my new favorite recipe. It is like winter ... in a cup! While you may be thinking I am a little winter crazed (the weather is so cold here!!) I can promise you I am not. While in Charleston in early December I ordered a Charleston Fog at The Park Cafe which was delicious. A fabulous earl grey latte with lavender and a toasted marshmallow on top. She asked if I wanted to add an espresso shot, which of course I was super excited about, and it was the perfect way to start the day. The marshmallow was the best part of that perfect drink, gooeyness all over my lips and all. I will admit to thinking of it fondly ever since! Tarvitsetko nopeaa ja kiireellistä lainaa, jossa on suhteellisen alhainen korkotaso niin alhainen kuin 6%? Tarjoamme yritysluottoja, henkilökohtaisia ​​lainoja, asuntolainoja, autolainoja, opintolainoja, velkakonsolidointilainoja e.t.c. riippumatta luottoarvostasi. Olemme varmoja antamasta taloudellisia palveluja lukuisille asiakkaillemme kaikkialla maailmassa. Joustavilla lainauspaketeillamme lainoja voidaan käsitellä ja siirtää lainanottajalle mahdollisimman lyhyessä ajassa, ota yhteyttä neuvontaan ja rahoitussuunnitteluun. Ota meihin yhteyttä sähköpostitse: sunloans.apply@gmail.com tai sunloans.apply24@outlook.com ja todistaa elämän muuttuvan taloudellisen kokemuksen. 20% Sale You Don’t Want to Miss! 10 Target Finds I Want NOW!